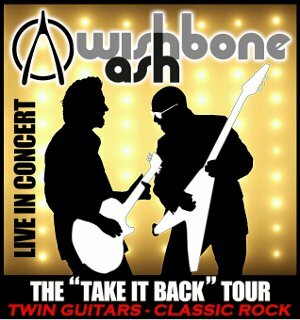 Classic rockers Wishbone Ash are once again coming back to the U.S. for a tour. The "Take It Back" tour, celebrating their 47th anniversary as a band, opens on September 8 in Denver and ends on September 29 at Daryl's House in Pawling, NY. Founding member Andy Powell said "We'd like to mix it up a little. Perhaps include a different epic instrumental, dust off a couple of the old harmony-driven songs, feature an unexpected track from our latest album, Blue Horizon. Wishbone Ash is led by Powell on guitar and vocals, trading licks with Finnish guitar master Muddy Manninen. Bassist Bob Skeat, an 19-year veteran of the band, sets the pace with Joe Crabtree, one of the best of Britain’s new breed of drummers, himself an 8-year Ash veteran, who also handles a lot of the band's tech requirements. The fruitful results of near-constant touring are evident on the latest DVD release, Live in Paris, recorded in May 2015 during a three-day residency at Le Triton Theatre in Les Lilas, Paris. The band recently released a four-disc Road Works box set, a compilation of four separate shows recorded in Germany and the UK. In October 2015, Powell completed his autobiography, Eyes Wide Open: True Tales of a Wishbone Ash Warrior, co-written with Irish music journalist Colin Harper. The book, published by Jawbone Press, has met with public and critical acclaim.